Many years have passed since I first heard Deicide, years in which the band themselves have gone on to become a parody of their once ferocious selves; but I refuse to believe I’m alone in crediting them for drastically affecting personal philosophies worldwide. I read somewhere the other day that it has to be a hollow simulacrum of a world one inhabits if something as peripheral as music can make them pause and reorient themselves. But this is a precariously literal and ironic way of interpreting music. Great music works on subliminal levels in conjunction with other mitigating factors, and challenges notions that may only be half-formed; in some cases, it even postulates altogether fresh notions. Great music provides a different vantage point from which to appreciate the stuff of life, and in its essence is a showdown with first principles. I didn’t grow up in a particularly religious family, nor did I have the Judeo-Christian background that Deicide so virulently raged against. My early adolescence was spent preoccupied with little else than sport. Ritual was performed dutifully, but only as a means to childish wish-fulfillment. My parents’ deteriorating marriage and my father’s alcohol addiction was steadily poisoning the climate at home, to the point where I think we as a family slipped into a collectively introverted coma for a number of years. I still went through liturgy by rote, but religious feeling is easier to sustain when a mind exists in relative harmony with those immediately around it. Incipient faith takes a terrible beating when you see your father smash the family Ganesha idol to the floor in a drunken fit. I have no fond recollection of this time today; it was a dull and stultified time which gave no chance or impetus to higher consciousness. What I’m trying to get at is the effect that listening to Deicide for the first time had on this morose and indifferent state of mind. Much of my affection for metal has developed retrospectively as I’ve come to appreciate its tradition and philosophy. But the first two Deicide albums were not only intoxicating hammer blows to the senses from the very beginning, but also legitimate catalysts to intellectual stimulation like few others. I will not deny that the iconoclasm present on Legion – so attractive to impressionable youth regardless of religious denomination – is its most important aspect; nor do I have much patience with those who purport to spin this music’s fundamentally transgressive nature into something aligned with their partisan views. But what makes Legion endure is the sheer musical-physical intimidation it brings to bear on the listener, and in its wake compelling him to reinspect himself and his values in the raw. It brooks no casual acquaintance; it molds the listener in its confrontational image, it makes him inquire after obscure detours, and it strikes the palm perpetually upturned in servility; and though life may subsequently take him on diverse roads, well-begun, as the saying goes, is half done. 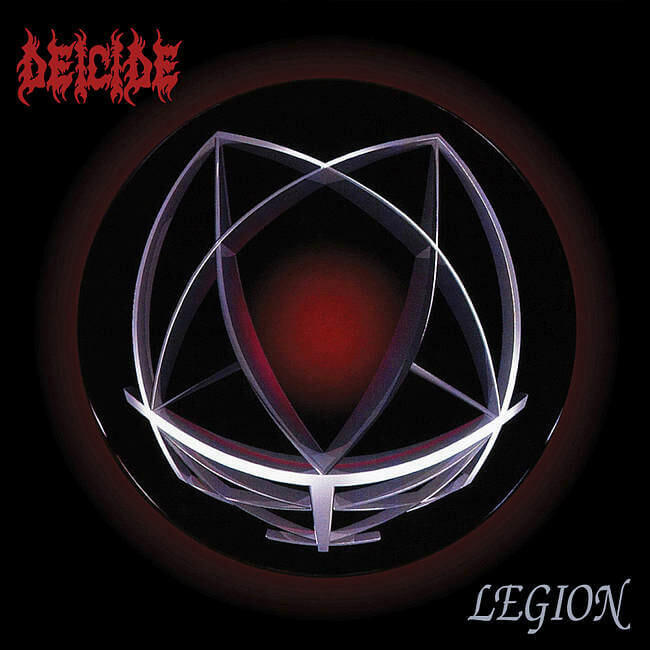 Legion, and Deicide, then become worthy first principles for a philosophy of metal. Steve Asheim times each drum hit to the guitar strum; when one considers the clustered and syncopated nature of these riffs, his performance reaches the most rarefied heights in genre history. Legion retains the patented Deicide groove from the debut, and introduces the short-form, rhythmic intricacy of contemporaries Suffocation and Sinister. Songs are unabashedly rooted in speed metal arrangements and use reiteration to make themselves known. Within a base platter of dissonant notes, varying degrees of angularity between note choices is employed to realize an apocalyptic sense of melody; broken riff sequences – best heard on classic closer ‘Revocate The Agitator‘- violently disrupt the natural progression and seemingly taper off into the ether before reuniting with the theme proper. It is a delicate balancing act, one that risks dissolution into incoherence, but which ultimately creates extreme white-knuckled tension at high speeds. The Hoffmans solo like Slayer on roids, Benton roars like hell’s warden, the whole affair awash in innocent blood takes about twenty-eight minutes, and death metal is changed forever. Poetic and progressive, Prophecies of a Dying World is one of the earliest realizations of the death metal epic, a side-genre which Timeghoul would only posthumously bring to wider recognition (Revenant would unfortunately be consigned to obscurity). Like a Terrence Malick film, Prophecies of a Dying World is an album of stark images, alternately bleached and imbued with breathtaking poignancy, and offering yet another approximation of what an instrumental death metal style would sound like. Admittedly, Henry Veggian’s lyrics are indispensable to the album; literate, fantastical and perhaps ecologically fatalistic, they eloquently present the case of a consciousness reduced to singularity, travelling through time – or should that be alongside time instead?- to avenge the crimes of the ancient past (read this superb interview with Henry Veggian). Prophecies of a Dying World is meticulously crafted and conceptually dense to the point of bursting. Revenant accomplished this admirable ideal not only through baroque maneuvers or cramming musical space with notes, but with palpably literary visualization put to music. Hearing this album following one of the progressive rock classics of 70s makes the debt it owes to that musical universe apparent. 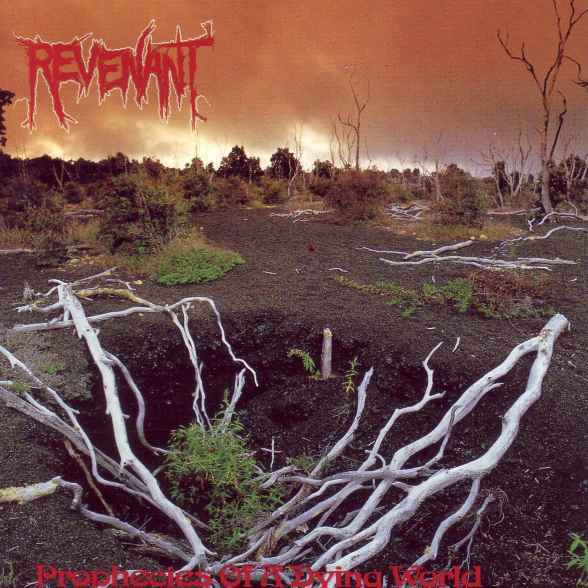 Revenant were first among death metal bands to tap into the expansive potential available to the genre; so much so it wouldn’t be stretching credulity to suggest that Prophecies of a Dying World makes use of certain ambient and developmental techniques – bookends, repeating motifs, multiple chapters and cadences, and subtle grasp of dynamics – that might be found on King Crimson‘s Red or Van Der Graaf Generator‘s early albums (hear ‘After The Flood‘ from The Least We Can Do Is Wave To Each Other for an off-the-cuff reference); far from making any direct allusion to the sound of those classic bands, what I’m trying to say is that Revenant reached much the same end destination while conforming to a distinctly caustic and metal tenor. As much as Prophecies of a Dying World represents a desirable way forward for death metal, Legion is a logical and unsurpassable culmination of one strand of the genre; when encountered at the opportune moment, it carries little less than the very force of revolutions. Legion goes through. This entry was posted in Death Metal, Death Metal Battle Royale and tagged Death Metal Battle Royale, Deicide, Legion, Prophecies of a Dying World, Revenant, round 1. Bookmark the permalink.